OCCC welcomed three new campus police officers this semester. Jimmy Watts, Kevin Hammond and Gordon Nelson all came from recent positions from higher education campus policing and are Council on Law Enforcement Education Training (CLEET) certified, which every officer in the state of Oklahoma has to be. Watts, who started Aug. 15, said that means the officers have completed 24 hours of continuing education and one hour of mental education, and are certified to carry a gun. The training is required yearly, he said. “I don’t think I necessarily meant to be a police officer until it just happened,” the 28-year-old said. Watts said his security career has been a vast one. 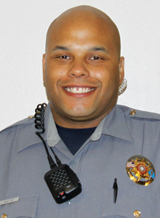 He said he worked for the Langston University Police Department for four and a half years prior to coming to OCCC. Watts said he also has done a stint in the army, been a bouncer at a night club which, Watts said, is where the security idea all started. He has been in various armed security positions off and on for about seven years, and worked at the Oklahoma County Sheriff’s Office as a detention officer for about two years. 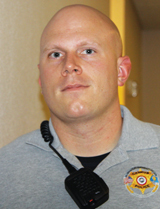 He also is a student at OSU-OKC in the bachelor’s program for emergency responders administration. He has an associate in police science from OSU-OKC. Watts said having a police force on campus will “promote a safer environment. “By being visible, I think that deters a lot. We want to promote awareness,” Watts said. Hammond, 29, graduated from the University of Central Oklahoma in 2005 with a bachelor’s degree in criminal justice, followed by a master’s degree in Business and Organizational Security Management from Webster University in Kansas in 2007. He said he was a security supervisor for about six years and came to OCCC after being a police officer for 10 months at Rose State College. 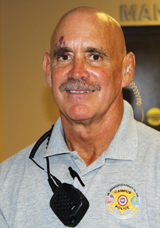 Nelson, 58, was a police officer for six months at Rose State College prior to becoming a campus police officer here. He said he worked as a parole officer for the Department of Corrections for 20 years. “I was a science teacher and a football and wrestling coach (before that),” Nelson said. Nelson said he believes his age and experience will be a benefit to OCCC. John Boyd, vice president of Business and Finance, said the choice to hire these three was made carefully. “We wanted to make sure the police officers we hired had an understanding of what an educational institution is all about,” Boyd said. “They all understand the dynamics of a campus, that they’re not patrolling the streets of OKC, that they’re dealing with students. The plan to add campus police to the college was made back in August 2010 at a Board of Regents meeting.